Some say thy fault is youth, some wantonness, Some say thy grace is youth and gentle sport; Both grace and faults are loved of more and less; Thou mak’st faults graces that to thee resort. As on the finger of a thronèd queen The basest jewel will be well esteemed, So are those errors that in thee are seen To truths translated, and for true things deemed. How many lambs might the stern wolf betray, If like a lamb he could his looks translate; How many gazers mightst thou lead away, If thou wouldst use the strength of all thy state! But do not so. I love thee in such sort, As thou being mine, mine is thy good report. You turn faults into charm, when they flock to you. Translated into virtues, and judged to be virtues. If he could transform his looks into those of a lamb? If you used all the powers of your condition! Since you are mine, your good reputation is also mine. Kim, Suzy. "Shakespeare's Sonnets Translation." LitCharts. LitCharts LLC, 11 May 2014. Web. 26 Apr 2019. Kim, Suzy. "Shakespeare's Sonnets Translation." LitCharts LLC, May 11, 2014. 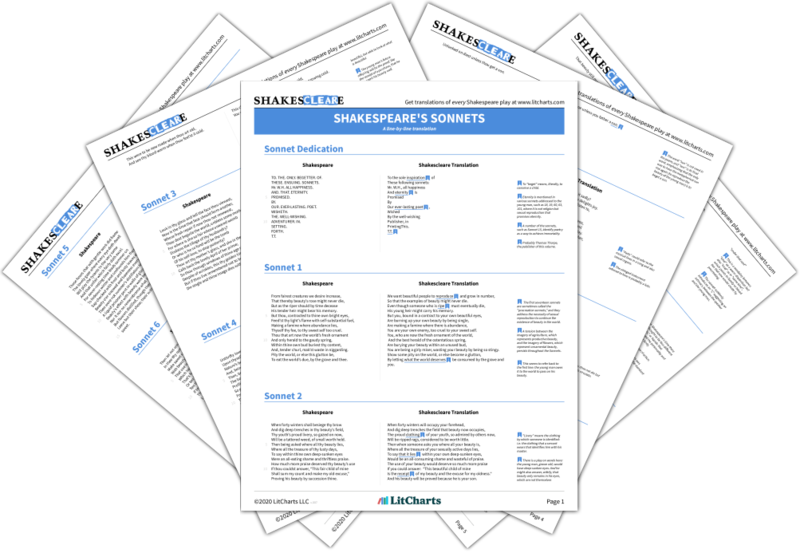 Retrieved April 26, 2019. https://www.litcharts.com/shakescleare/shakespeare-translations/sonnets.